Have you ever been subject to a lie-detector test? Ever had to hold up a lead weight with your head until your neck muscles scream out that they can do so no longer? Have you had electrical currents passed through your body to see how fit you are? Ever experienced brain ache from absurdly tough memory tests – all the time under pressure not to make a mistake? I have. All in the quest to experience what life is really like for a modern day racing driver. In fact, during a 48-hour racing driver experience at the Yas Marina circuit a few weeks ago, I got a new-found respect for the men who go out there on track every fortnight in the quest for F1 glory. For no matter how much you ever read about how fit, strong and mentally alert racing drivers are, it is only when you experience first hand what they go through that you can really appreciate all that it takes to be an F1 star. And I can tell you first hand, it can hurt a lot! Anyone who follows motor racing, knows that drivers are a fit bunch. We read their countless tweets about 40-kilometre bike rides, triathlon efforts and gym sessions – and then dream ourselves that we are not too far away from being able to match them. But being fit in racing driver terms is a world away from what you and I would consider fit. For, make no mistake, F1 is the most physically demanding sport in the world when it comes to punishing the heart. Italian sports clinic Formula Medicine has turned the subject of racing driver fitness into an art form – and its staff are under no illusions about how tough F1 is on the heart. Fabrizio Maganzi, one of Formula Medicine's personal trainers, says: "A lot of people ask the question of whether motorsport is a real sport. Normally when people see a sport like cycling or soccer or athletics they can see for themselves that there is a big effort – as you see them sweating. In motorsport it is difficult because you see just a helmet and a car – and you cannot understand the effort of an F1 driver. "But we know it is real sport. The heart rate monitors shows that for one hour and a half hours drivers stay at 184 beats per minute average, with a peak of 201. And in GP2, it is one hour the average is 196 – with a peak of 207. It is a bit more in GP2 because the cars are similar, there is more wheel-to-wheel fighting, the racing is shorter – and there no power steering so the car is heavier. In no other sport do you experience this level of heart rate for so long." Formula Medicine began monitoring heart rate performance in F1 as long ago as 1989, when it wired up Ivan Capelli in a Leyton House. Since then, it has recorded more than 30 drivers in more than 100 races, using both standard heart-rate monitors and modern electro-cardiogram systems that give second-by-second analysis. It was the use of the latter more sophisticated technology that unearthed an amazing physical phenomena that drivers experienced at the Magny-Cours circuit. "We discovered that in one second, the drivers' heart rate would go from 160 beats per minute to just 54 – it was like a collapse," says Maganzi. "At the Adelaide Hairpin, the drivers would arrive very, very fast – with heavy braking, and then hard acceleration again for another straight. "When the drivers got back on the power, the heart rate dropped dramatically – sometimes 54, sometimes 60, sometimes 70. It was a big drop. It shows you have to be ready and prepared to drive an F1 car – you cannot just jump in and drive like that. Normal people would not be able to do it." It is not just the heart that gets put under extreme stresses. The neck is another area that everyone hears about from racing drivers. The extreme G-forces experienced through high-speed corners means a driver can sometimes find his head and helmet feeling as though they weigh 25kg. Maganzi explains: "Normally the average force is around 1.5-2G in a corner, so if you can imagine the head with the helmet weighing 7kg – so 2G is 14kg. "For example, the most difficult circuits are Suzuka or Brazil, where the average is highest and there is Turn 3 in Brazil which is close to five G – so it is around 35kg each time, but only for one second. In Turkey, Turn 8, it is four corners in one and you stay around 4G for four seconds and that is stressful. "For shoulder and arms, the average on each corner is 10kg that you have to turn. The maximum is 15kg - 20kg depending on corners. 30kg is maximum of neck." Just like having the heart for the job, the muscles needed for these strains require some pretty tough training exercises – some of which we got the chance to experience to see how we shaped up against the drivers. By far the toughest test was for the neck. After putting on a specially prepared helmet which was fitted with some hooks, a 5kg weight was attached while we lay on a bed. Keeping our heads horizontal, the aim was to try and keep the weight off the ground for as long as possible. Lying there, the initial shock your neck muscles go through as they cope with the weight gets replaced with a slow lingering pain, which gets worse and worse. Seconds ticking by seem like minutes. After just more than three minutes my body cried enough. While those three minutes seemed like a lifetime, it was put into perspective when I was informed that top-line drivers can easily do it for 10. The gulf between what us mere mortals can do and what racing drivers are expected to do was highlighted by a plethora of other tests. I stopped the clock at 4m30s for a chest muscle test - of holding two-kilogramme weights on outstretched arms just off the ground while lying on my back. Racing drivers are expected to do more than eight minutes. A hand-power test conducted with some special hand grips showed I had a 'squeeze power' of 43.4kg. Racing drivers have more than 60kg. I lasted two minutes on a special steering rig, where a 2.5kg weight is attached to a wheel and, when held up horizontally, simulates the forces drivers experience through cornering. Drivers should top five minutes on it. Upping the weight to 5kg, I lasted just 1m40s, where the weight had to be moved from 90-degrees left to 90-degrees right every few seconds. Drivers can do it for more than six minutes. It is not just speed then where I lack. While the physical demands of being an F1 driver are quite obvious, the brain skills needed to be successful are much less talked about. One of the myths about racing drivers is that all they need are wizard-quick reaction times, but that could not be further from the truth. You can ask GP2 front-runner Jules Bianchi to testify on that front after I whipped him 9-0 in the reaction test head-to-head competition. Formula Medicine has conducted a series of full brain scans on drivers to get an understanding of where they are strong, and it proves that reactions are not an important element. "Over four years we put 12 drivers through a brain scan to do some tests and we did the same thing with 12 normal people – students and doctors," says Formula Medicine chief Dr Riccardo Ceccarelli. "These tests showed the flow of blood is less in the brain of drivers, although their performance and reaction time were exactly the same. People were expecting reactions to be much faster in drivers, but reaction time is not the main characteristic of drivers, because it is really only used at the race start and in some overtaking moves." What Ceccarelli discovered was that a racing driver's brain has to be finely tuned in a whole number of areas – reaction, concentration, attention, memory and visual co-ordination. "Motorsport, especially top level like F1, is a psycho-physical sport. If you consider a marathon you can run 26 miles and switch off the brain. It is better to switch off the brain so you don't think about how tired you are, you just go on automatically. You cannot do the same in tennis, you need concentration and thinking. "You need to be strong and work a lot mentally. It [motorsport] is the top for the heart rate, the highest – no other sport keeps the heart rate so high for nearly two hours. It demands a lot on the body – the muscles for sure, but also the brain. "We work a little bit on the muscles but also on the brain. We try to have a similar approach – an evaluation of the mental performance. The brain can improve, the brain can be trained. To be fast is important, but what is more important is to be consistent." 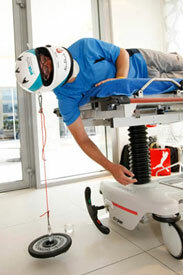 Formula Medicine has pioneered a series of tests that are used to evaluate the areas where drivers need to be strong. 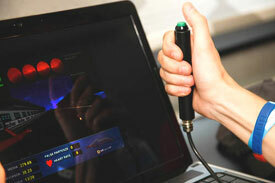 There is a reaction test – where you trigger a button as soon as a set of lights turn from red to green. Rather than doing it once, however, you complete the test 20 times – and the most important aspect is not your single best time but how consistent you are throughout the whole experiment. Further tests include a hand-eye co-ordination test where you have to trigger a button to get a racing car to stop at a moving yellow line on the screen, and also a memory test where you have to recount five symbols as they disappear from screen. The most fiendishly difficult test though, is the concentration test. Here, the words of colours flash up on a screen – although not necessarily in the same colour as the word itself. Should a colour word appear in its right colour – so 'brown' is in a brown colour, 'pink' is in pink – then you have to hit the 'true' trigger. If the word is in the wrong colour – so 'brown' is written in yellow – then you have to hit the 'false' trigger. While that may seem simple, the true and false triggers keep switching with every go – so for one answer true may be the left trigger, while the next that triggers the false response. There is just one second to answer each question before the next one pops up – so if you delay for a fraction in answering one, you can find yourself wrongly answering the following question. Then panic sets in! Getting the right responses is easy for the first 15 or so questions, but as they keep coming thick and fast it is all too easy to get flummoxed – either by delaying slightly in answering one or getting one wrong. Ultimately, it is all about concentration. Ceccarelli said that in his experience, only one driver got 100 per cent at his first attempt – Marc Gene. 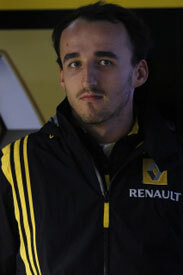 Now though, he says Robert Kubica is the expert. The Pole is easily able to get 100 per cent at each go – but more impressive than that, he is able to answer the 100 questions in just 62 seconds. I struggled to get over 75 per cent right in the full 100 seconds. But training the brain is not just about being able to deliver at peak performance. It is also about getting the body into the right frame for the demands of racing. One of the areas that Formula Medicine looks at as well is stress – and training drivers to cope with pressure better. That is where the lie-detector comes in – so the clinic can see how well a driver is able to lower his heart-rate by controlling stress. "It takes the parameters of the body that you cannot control and that automatically increase when you are under stress – the tension of forehead muscle, the sweating of the finger, the temperature of the finger and the heart rate," explains Ceccarelli. "Then we try to investigate the driver, how much he can manage the stress and we test the relaxing techniques." When wired up, I managed to get my heart-rate down from 69bpm to 64bpm in two minutes – so a reduction of 5bpm. Trained racing drivers – whose pulses vary from 60bpm to 70bpm – can get theirs down to 55bpm. Mental training is all about maintaining the peak performance for longer – by ensuring the brain is not working as hard at a certain level. Delivering quick laptimes in a race – the extra two or three tenths that can come on a crucial in-lap to the pits – is all about mental effort, not physical. By lowering what the brain is doing, in theory, Ceccarelli thinks that can help deliver a tangible difference on track – as he has witnessed during one race that Formula Medicine monitored. "We want to work on the mental side in order to obtain the maximum performance of the brain constantly," he explains. "There was one race where a driver was able to stay in qualifying form all race long – a heart rate of around 176 beats for every lap. All the race long – the difference was five beats. It means he was close to the limit all the time and the BPM line was perfectly straight. So it is possible to achieve this but it's very hard work to reach this level. "It's about better performance, less consumption. Think of it like two different cars going at 200km/h. One will consume a lot of fuel, another one won't – so the more economical car can last more. That is the difference." Check out part two of Jonathan's adventure in Abu Dhabi later this week. Click here to subcribe to AUTOSPORT.com Plus, for more amazing content like this.